The following is from an email I wrote to someone who asked if I was going to be presenting at the EduTech conference in Brisbane this year. As you can see, my answer is no, but I think what’s important is my reason for saying no. If you’re planning to present at EduTech, I hope you consider the effect of saying yes. To be honest, I am not a big fan of EduTech, mainly because I really don’t like their policy of non-payment for Australian speakers. I find it quite insulting that they are willing to pour outrageous amounts of money into getting overseas speakers but are not willing to pay anything for local speakers. I think they need to approach this with greater equity and offer ALL their speakers some form of payment, even if the locals just get a token amount. As I’ve no doubt pointed out before, this is a (very) commercial event run for profit by a professional conference-running company, and yet they expect the vast majority of what they are offering to their customers (at a significant price) to be provided to them for free. On http://www.edutech.net.au/apply_speaker.html it clearly states that “in the vast majority of cases, we do not pay speakers”. Obviously that blanket statement is not true, as they pay many of their “big name” overseas speakers. What they mean to say is that they don’t pay local speakers because they feel they can get away with that. They also make the very generous point on that page that they “don’t charge speakers to speak”. Woop-de-do, EduTech. While I’d be very happy to present something, on principle I’m not really willing to be exploited by the EduTech organisers who expect that all Australian presenters should be willing to present for them for free. It just doesn’t make sense to me. I’d love to see all Aussie presenters just say no to EduTech but it probably won’t happen. There are many many great things I’m happy to give my time freely to… helping other teachers, sharing resources, giving time and energy at the grassroots level. But I’m not ok with helping EduTech carry on their culture of exploitation of Australian presenters just so they can make more money. Exploiting Opportunities by Chris Betcher is licensed under a Creative Commons Attribution-ShareAlike 4.0 International License. Really surprised by this. I would have thought people would be invited to present based on their merits. I am guessing Edutech think they need the big overseas names to draw a crowd? Having been to many of these conferences, Chris’ presentations have been world class and deserving of top billing and top price at a conference like this. I hope this post gets some people asking questions of Edutech. Is this a similar situation at other conferences like the one IWBNet runs? I completely support your stand on this Chris. If it’s good enough for EduTech to pay for one type for presenter, it’s good enough for them to pay for all. Shame on Edutech! Australian presenters such as Chris have their finger on the pulse of what is happening here in the classrooms and the implementation of the Australian Curriculum. While it is great to hear what is happening globally, it is the local knowledge and advice that will enable teachers to take away great ideas that are immediately applicable in the classroom and will have the most impact on change in classroom practices. Don’t you work for (or at least with) EdTech team who seem to have exactly the same business model – they make their money by relying on speakers to fill their program and aren’t compensated for their time or expertise? Hi Johnny, fair comment. I think it’s different for a couple of reasons. Just to clarify, on the two occasions I’ve been invited to speak or present by the organisers of EduTech (once as a keynote at EduTech Brisbane, and once as a workshop presenter running several sessions at Future Schools, Sydney) I have never been offered any form of payment. If these were event I wanted to go to anyway (they weren’t particularly), and I was interested in volunteering to present, then maybe getting a free registration would make it a reasonable deal. However, I was asked to do a keynote at EduTech in Brisbane last year. When they sent me the contract there was no mention of payment, because they had no plans to pay anything. When I questioned this, they did eventually offer to cover my travel expenses to get to Brisbane, but only after I told them I wasn’t interested in doing it otherwise. Bear in mind, it meant taking time off work and away from family to travel to an event I had no real intention of going to anyway. And I didn’t offer to present… they asked me. So, How is that different to EdTechTeam? In a couple of ways I think. 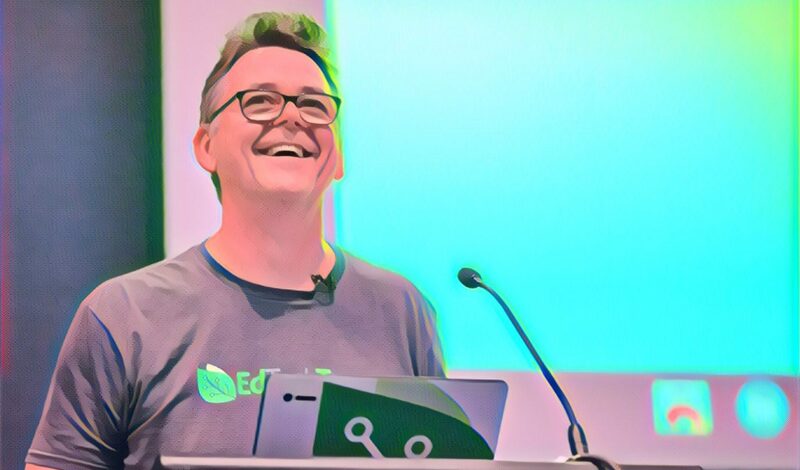 Without going into the details of how EdTechTeam is structured, we have a core global team of presenters from all over the world that allow us to run events that can be scaled up or down depending on need. Based on the number of people who register for any of our events, we often bring in presenters from our global team so we can scale up to meet that requirement. In most cases we run our events just from this collection of selected, talented educators and we certainly do pay those presenters. That said, we do also ofter local presenters the opportunity to present at our events if they want to. I think the difference is that these people volunteer to present. In return for a single session they get free registration to the whole event (an event they presumably wanted to attend anyway) as well as being invited to our speaker’s social where in some small way we try to thank them with food and drinks. Where I think that’s different to the way EduTech does it, is that they volunteer to do it and they are always locals who planned to attend the event anyway. So the basic idea is that if we specifically come to you and ask you to present for us, you would expect to get paid (but you’d usually need to do more than a single session). However, if you volunteer yourself to present, then we at least give free registration and a social event. None of that would apply to a keynote speaker of course, who would definitely get paid. I don’t want to be hypocritical about my complaints. I think at EdTechTeam we always try to do the right thing by our presenters. Thanks for the honest response Chris. Having been just such a presenter twice for EdTech conferences, I can attest that having my registration covered to an event I wanted to attend allowed me to both go and gain experience with presenting my take on how to help improve student learning and the teaching profession. There is a lot of money being made by companies promoting tools and conferences that are not as honorable as I have found EdTech to be. There are many studies in marketing that show if the price is $0.00 most consumers do not see a value. If there is a small price the value perception goes up. Why are teachers expected to give away our knowledge and expertise for free? Would anyone expect a different professional to present on their own dime? Asking to be paid is insult enough in my opinion. Thanks for expressing and holding to your values Chris. Thanks for writing that and enlightening us to the fact that they have a policy such as this Chris. I think it preposterous that they think so little of the Australian speakers, ones that us Aussie identify with more than those from overseas anyway. Good on you, and hope you let them know as much Chris. As an exhibitor at Edutech, I can say that it is the most expensive event on our calendar by a huge margin. The costs for exhibitors let alone sponsors is significantly more expensive than any other events we engage with, many in similar venues. An example of how much money they are making is the exhibition showcase prize (eg, visit the exhibitors, get a stamp and go into the draw for a prize) is a brand new car. Granted it’s voluntary to participate in that but it does paint the picture. Every time you breathe, sneeze or cough there’s another fee. With the money they are charging vendors and the numbers of vendors in attendance there shouldn’t be any issue at all regarding available budget to fund speakers. Chris, just wanted to let you know I love Google Educast. Recently, I signed up for a course on IWBs and was so pleasantly surprised when I saw the author of the book for the course was you (I said in my best Australian accent, it’s Chris Betcha!) I’m an elementary school teacher in a small town in Michigan, and even I know your name and your contributions — I know I’d pay to hear you — can’t believe they’d ask you share your expertise for free. I’ve presented at a few Tech sessions around Australia (not Edutech though) and even though flights and accommodation are paid for, presenting and time spent preparing aren’t. I agree, the top international presenters are paid a lot and what about teachers who are sharing their ideas and innovations? Who knows, maybe I’ll be qualified enough to be paid when I complete my PHD?